I haven’t posted in a while, so I’ll use this opportunity to plug one of my favorite iOS games – Battle Nations! So I’ve been playing Battle Nations for iOS mobile since the end of 2011, shortly before the first major patch in, 1.1 (January 2012). 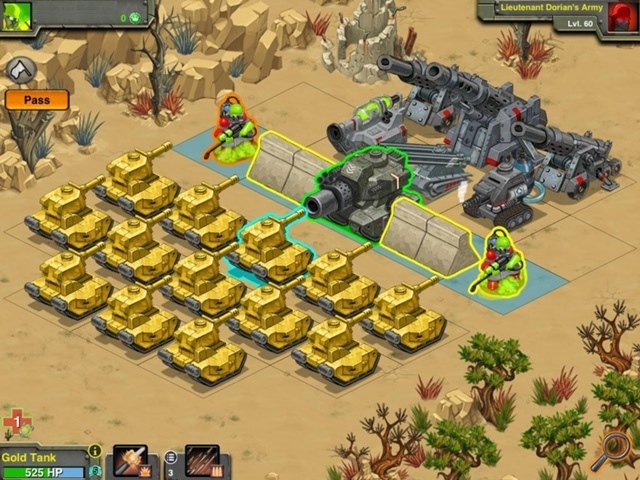 At first glance, it felt like a “farmville” with tanks and soldiers, and was complete with its free-to-play (F2P) trappings – constructing buildings took 5 minutes, and the tutorial wanted you to spend the “premium” resource, a nanopod, to instantly complete that task. 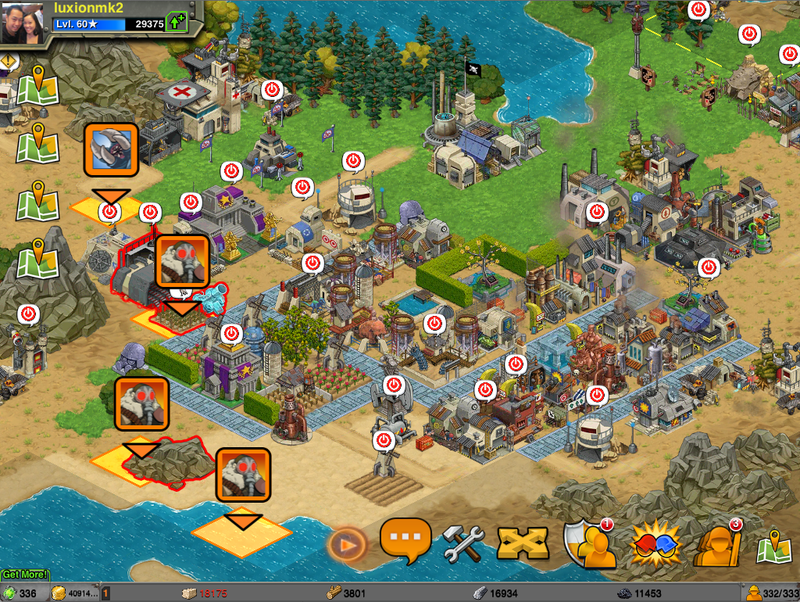 Early “missions” requires you to build stuff from the shops, build soldiers, and construct buildings. Each task required you to wait from 5 minutes to half-an-hour. As you progress, you start to see that more advanced buildings and soldiers took upwards of an hour, and much later, 6 hours to 12 hours. Have I lost you yet? 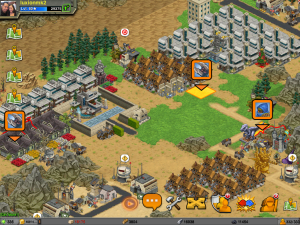 Here are screenshots of my outpost. Note that I am a functional player and not an aesthetic one. Commercial district – where I produce goods for gold and XP. What sets this game apart from other “farmvilles”, or what I call “tap-to-collect” games, are the battles. I’ve tried numerous games with a combat system that is range from simple rock-paper-scissors to a lack of interaction at all. Battle Nations is different. The stats mean something. 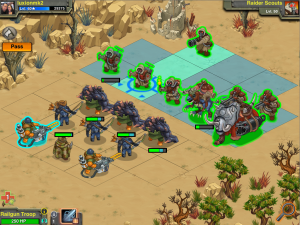 There is actually a lot of thought and tactics involved in the turn-based battles. Random numbers (and thus luck) have a lot to do with the game, especially when facing the computer. PvP can really test your mettle, assuming that you’re facing a balanced opponent. Sometimes you can be stuck against a weak formation or an overpowered one. Sometimes the fight goes down to the wire, and your opponent seeing their impending defeat will wait out their turn timer :/ I haven’t PvP’d in a long while, but I think the developers, Z2Live, have addressed that problem, along with stalemates. Anyways, combat is where the core of the game is, and one of the reasons I’m still playing to this day. It does have its ruts though, as combat against the computer can get stale. As your units get stronger, enemy formations become less of a challenge and more predictable. At higher levels, some enemy formations will seem “broken” and overpowered, but I accept and am happy about that – my hospital needs something to do. I can’t expect to leave every battle unscathed, and for a long time, the game didn’t challenge me. Fending off invading Raiders from my land! In the above screenshot, it features a mix of premium troops (purchased with nanopods), prestigious troops awarded to only the highest level players, and some rare, lottery-like troops – in this case, the three “Colossus” on the front line, available during a special Halloween event. I lost one Colossus in that resulting battle! Anyways, I just wanted to plug the game a little bit and announce that version 3.0 is coming out soon! It has been submitted to Apple and is awaiting approval. 3.0 introduces a new feature to provide guilds something to do – Boss Strike! I will perhaps do a full review for Battle Nations in a future blog post. A parting gift: a picture I stole from the Z2 Boss Strike guide to show off cool battle formations!